Ambiente Blog • The balcony is the city-dweller’s garden. In cities, balconies are gardens. And they offer just as many design possibilities as the traditional back garden – in miniature. This year’s key trends are ethno, retro and minimalist. But which one to choose? We consult a real expert on planting on balconies, ask what’s currently in demand and see what goes with each style. Let’s find out what your balcony type is! Your living room is expanding outwards. What this means in practice is that the age of rickety folding chairs with thin foam cushions is thankfully a thing of the past. Quality, comfortable furniture covered in attractive textiles is a must-have on this season’s balcony. So let’s go outside, taking cushions and rugs to create a cosy exterior. Just look at these cushions by Swedish label Eightmood – the designers show us so many shapes and materials it’s an invitation to slow down and take a rest. You can just picture yourself in this open-air living room, drinking a cup of tea with your feet up. The right rug for a balcony will be robust, weather-proof and water-resistant. 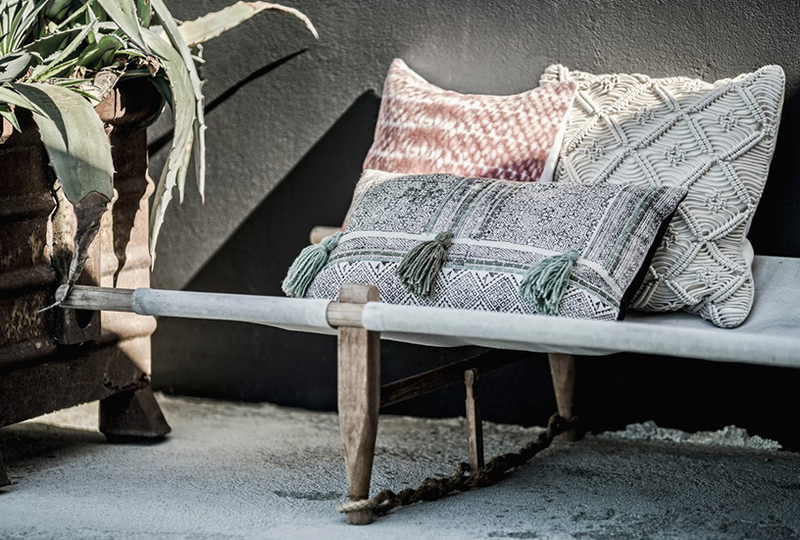 Fatboy makes rugs suited to both indoor and outdoor use, and their wonderful patterns will transform your balcony into an oasis of ethnically inspired relaxation. Rugs on the wall also work well, like this woven example from Danish label AU Maison. Flowers in fitting macramé plant hangers, which have already staged a successful indoor comeback, complete the look. An on-trend fire bowl like this one from House Doctor can provide warmth and add romantic mood when the evenings are still a little chilly. A handy pouf makes for impromptu extra seating when an unexpected guest or two turn up on the balcony. The general rule is: mix it up! A wide variety of patterns, textures and materials can – and must – be combined. Only then will your ethnic look be truly complete. If the ethnic look or oriental influences are not for you, and you’d rather face the first rays of sun on your balcony with bright colours and a retro style, you’re certainly in luck this year. The biggest source of inspiration for this trend seems to be the 1950s, with bright pink plastic flamingos as a tour de force – flocking from American front yards to balconies all over the world. It’s enough to make you put on your pinny and serve your guests lovingly crafted canapes! Yet we also identified borrowings and design influences from the 1960s and 70s in this year’s retro revival, which really takes us back to the good old days. Lovers of the fashions of past decades seeking a suitable alternative to macramé will relish this plant hanger with a vintage pattern from Wild & Wolf. Herstera Garden has made a treat for keen gardeners with this flame-red ‘raised bed’. It’s a trolley, to make it easy to move and fill, and is ideal for a herb garden. Our top tip: mint is easy to grow and also a key ingredient in summer cocktails, so why not keep some close at hand? The metal chair by Fermob not only looks like a throwback to the past, but would also be at home in an intimate bistro. Perhaps the couple pictured on the back are the world’s most famous star-crossed lovers? Romeo and Juliet certainly knew the best use for a balcony. For a more colourful, playful approach, simply add a seed bomb from Kabloom. What’s a seed bomb, you might well ask. It’s a ball of recycled material containing seeds for flowers known to attract lots of butterflies. And what could be a better accompaniment to a bright retro balcony than a flock of these colourful creatures? What if you don’t like bold mixes of patterns, or striking retro flavours? If you like to keep it sleek and functional? We’ve found just the thing for you among the latest balcony trends. This battery bench by Kreafunk is a real all-rounder to make tech heads’ hearts beat faster. 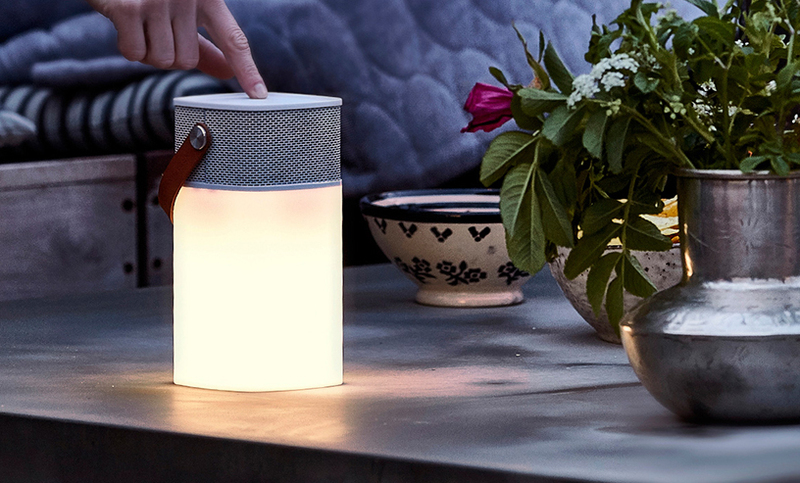 Not only will it charge your mobile or tablet in the blink of an eye, but built-in speakers and a lamp – with dimmer – add mood music and a warm glow to go with it. Not forgetting the microphone that makes hands-free calls easy. The cube by Höfats is a real multi-tasker that wins hands down for its simple, stylish design. It combines grill, fire bowl, stool and side table in one, which saves a lot of space. This is a multifunctional marvel. You can hang a barbecue inside, or close the lid to use it as a seat or table. Alessi’s rocking bowl is equally space-saving, either upright as a design object or horizontal as a fruit bowl. Authentics offer a sculptural, teardrop lamp that’s also a fine upstanding addition to any balcony. If it’s knocked into, it always returns to an upright position. This ensures nothing gets broken if your balcony becomes a bit busy. Hanging baskets aren’t a natural choice for minimalists. Luckily D&M Depot do an angular, white set of plant pots that sit very well on a balcony wall. They would suit trailing plants or a small, fragrant herb garden. Minimal look, minimal effort. “We use the term ‘harmonise’ to describe a plant trend that contrasts with the ‘energise’ trend and is all about calm, muted colours. 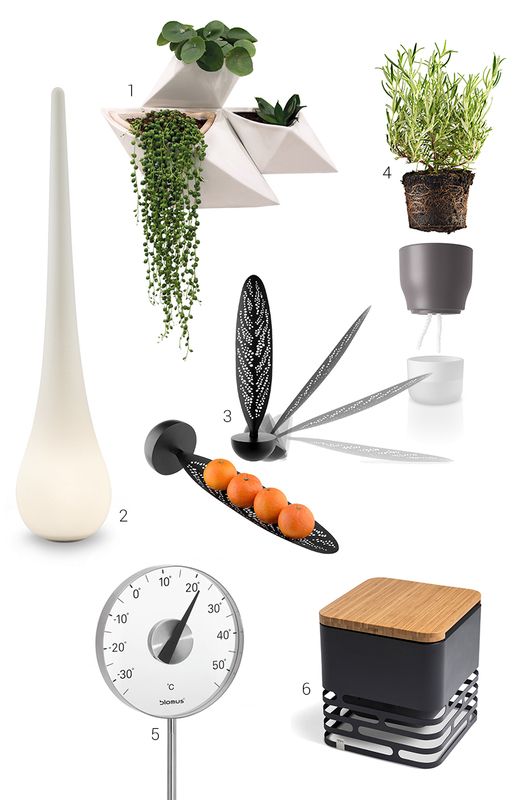 It’s a look that can complement minimalist, functional outdoor furniture and accessories beautifully, and creates a stylish, understated ensemble,” says our plant expert Teuber. 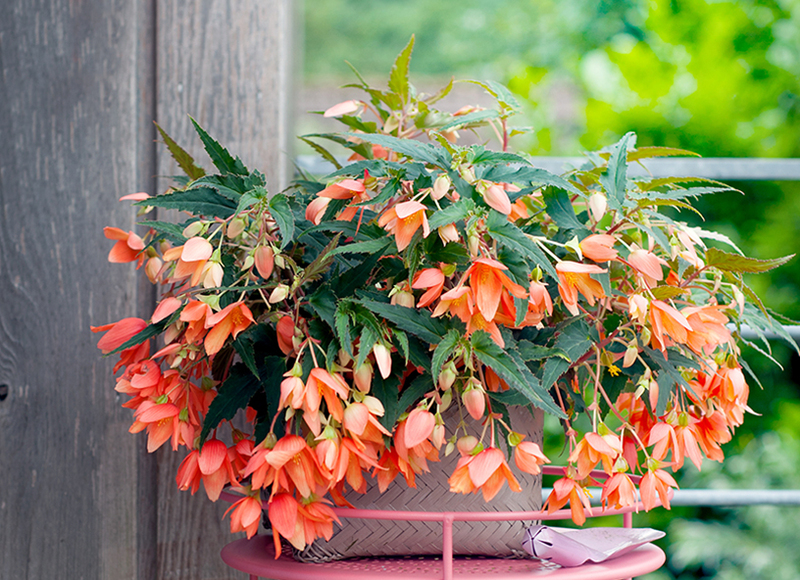 There’s no way round it, whichever trend takes your fancy, the trailing begonia is this year’s star plant. Frank Teuber sums it up nicely: “Begonias no longer have an old-fashioned reputation, and are included in the most modern settings.” He expands on this, saying begonias are the stars of balcony planting as they can do without a lot of attention and tending. 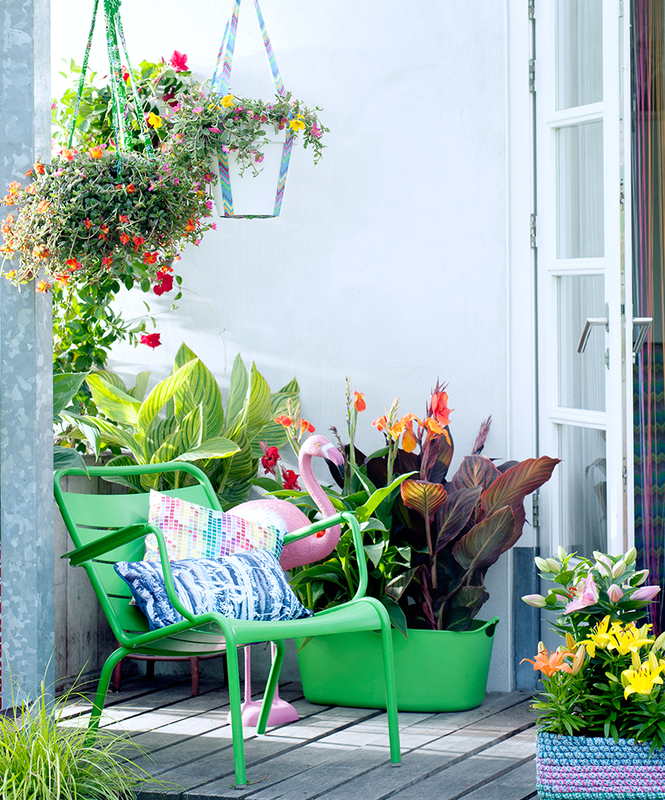 We, too, can really see how the wide variety of begonia colours and shapes make them ideal for this year’s balcony.